Over the last couple of years, I’ve been sharing our experiences with trying to live more in tune with nature and the seasons. 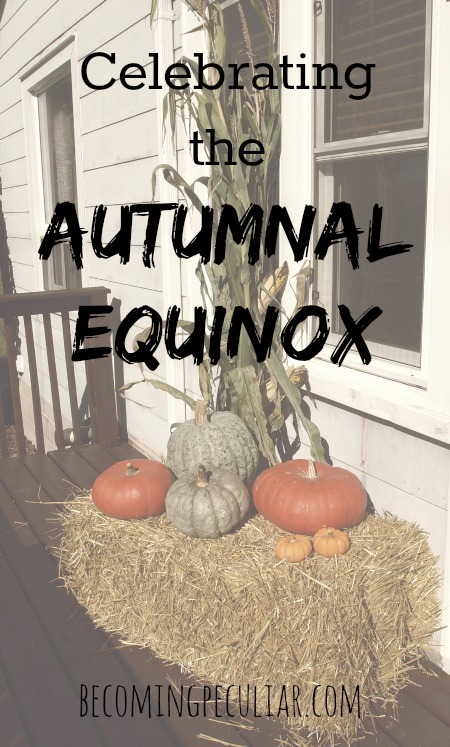 It can take some effort these days in our climate-controlled world, so I try to be intentional about observing and celebrating the changes of the seasons, especially on the equinoxes and solstices. The autumnal equinox is a time for gratitude and celebrating abundance as we bring in the harvest. Like its sister, the spring equinox, the autumnal equinox the day of the year when day and night are perfectly balanced; but this time it’s just about to tip towards darkness. Throughout the many holidays rooted in this time of year — shared by pagans, Jews and Christians alike (Mabon, Rosh Hashanah, Thanksgiving, etc) — you can find universal themes of abundance, thanksgiving, and sharing. These themes are made so much more real when you actually participate in your food production and preservation. I’ve been blessed to spend quite a bit of time in the last weeks harvesting and canning food from the garden, and all those bright reds and oranges and yellows (tomatoes, pumpkins, squash) just make my heart want to sing with gratitude. Anyway, this year we had a wonderful time celebrating the autumnal equinox with friends. 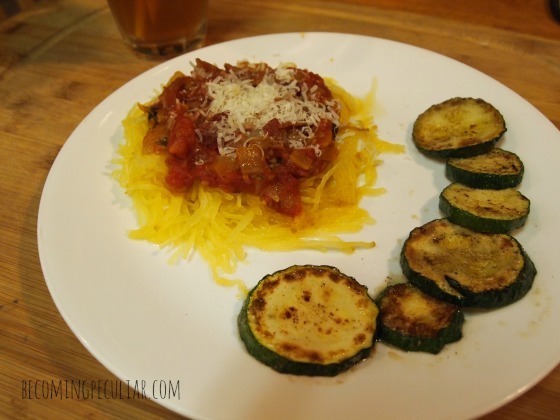 Here’s what we did, as well as a few additional ideas for celebrating the coming of fall. We seriously love this place. 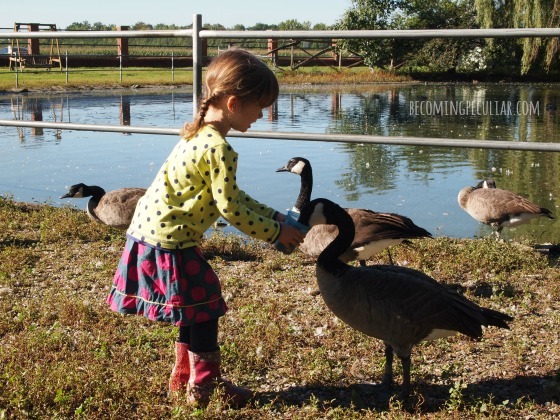 At Jack Miner’s bird sanctuary, we can come see the Canada geese who are making their way south for the winter (and the injured ones who are staying there permanently) and feed them barley. I’ve been taking Lydia for the last few years so she’s really comfortable with these large birds. It’s a great opportunity to talk about birds and migration, too! We went with a group of friends which made it extra-fun. 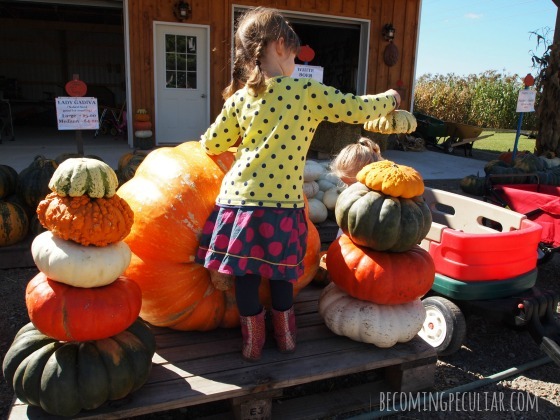 Right down the road from the bird sanctuary is a family farm that sells pumpkins, gourds, straw bales, corn stalks, and other wonderful, natural, autumnal decor. So after we spent some time with the geese, we drove down to admire and buy some pumpkins. Some people wanted pumpkins to carve; others to make pie. It was lovely to walk among all the beautiful pumpkins and take pictures and try to decide what we wanted to take home. I already had a bunch of beautiful pumpkins from my family’s garden, so I just got a straw bale. This has become my central and favourite way to celebrate the changes of the season. 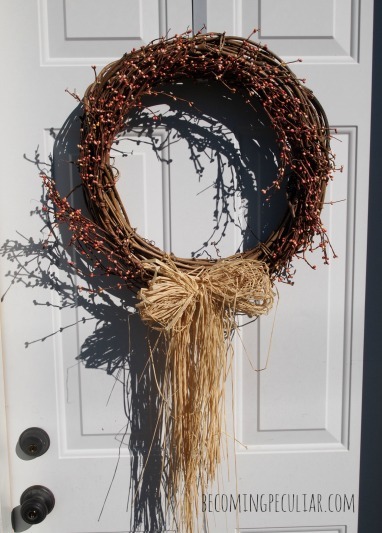 (Calling it “decorating the threshold” sounds so much more official than “swapping in the new wreath on the front door”). I love having my front entrance reflect the seasons. 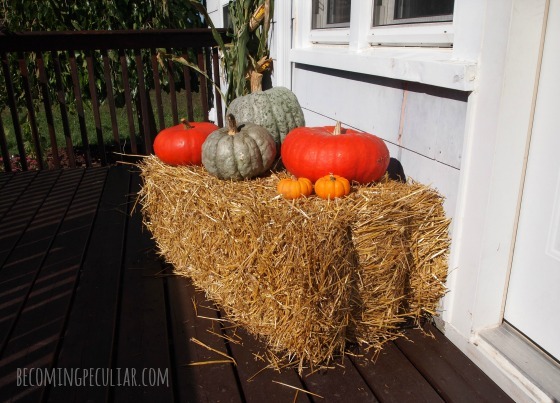 I put up my fall wreath and set up a pretty little spot with the straw bale and pumpkins. (I like my decorations to be multi-purpose, so after the season is over the straw will go into the chicken coop as bedding and the pumpkins will be roasted, steamed, and turned into muffins.) I get a reminder of how beautiful and bountiful fall is every time I walk through the door. Creating a centerpiece using candles, gourds, leaves, and Indian corn is a great way to bring nature to the table (I did this last year). I might try this table runner using fallen leaves yet, too. Or, if you have a seasonal tablecloth, the equinox is the perfect time to bring it out! Since thankfulness is a universal theme in autumnal/harvest festivals, it makes sense to express gratitude to the Creator of all things. The equinox is a perfect time to pause before a meal, as a family, and consider all the things we’re grateful for. In addition, I love this prayer by Kathleen Jenks. (I cannot for the life of me find the original source. Anyone know?) It seems so appropriate to consider the fragility of life as plants begin to wither and fall. I think it’s so important to instill in our children a sense of responsibility and awe for the created world. “As autumn returns to earth’s northern hemisphere, and day and night are briefly, but perfectly, balanced at the equinox, may we remember anew how fragile life is —- human life, surely, but also the lives of all other creatures, trees and plants, waters and winds. This is a common Waldorf and Montessori practice, and one that I’ve only now started up. The idea is to keep an area in your home — a shelf, table, windowsill, or in our case, the top of a cabinet — for setting out seasonal objects from nature. It’s a great place for children to store the treasures they find outside. I felt the equinox was the perfect time to set it up. I mounted our spider-web prints on the wall above, as well as our fall-themed watercolour cards. I set out a basket of little white pumpkins we inadvertently grew (but aren’t they adorable?! ), Indian corn, and some pine cones and acorns we gathered last year. Over time, I hope to add leaves and other items (our trees haven’t really started changing colour yet). Lydia likes to incorporate these items in her play, and I encourage it. Apparently unicorns love to eat white pumpkins. I haven’t done this yet, but I was inspired by this post by Marking the Seasons about seasonal sensory bins. 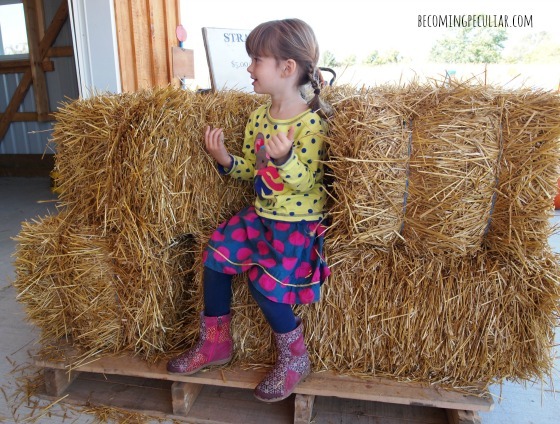 I want to get back into using our sensory table and this seems perfect. I’ve purchased a big bag of red lentils and I just need to add some fun fall items for some sensory play. Instead of pumpkins, picking apples would be a great way to kick off the new season. We might try this later this month. I got this idea from the book Heaven on Earth, and I want to try it yet. It sounds like a fun, kid-friendly way to preserve apples for the winter: thinly slice apples and then thread them and hang them to make an apple garland, where they can dry naturally. It’s decorative and functional! 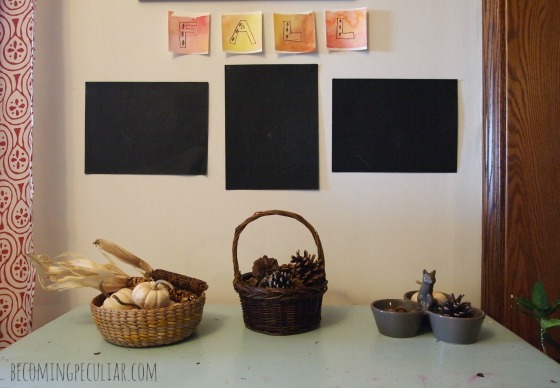 There are endless ideas for crafts using leaves, corn cobs, and other natural fall elements. Pinterest is exploding with ideas. One that I want to try yet (once the leaves start actually turning) is this beautiful leaf bunting. Or these leaf suncatchers. 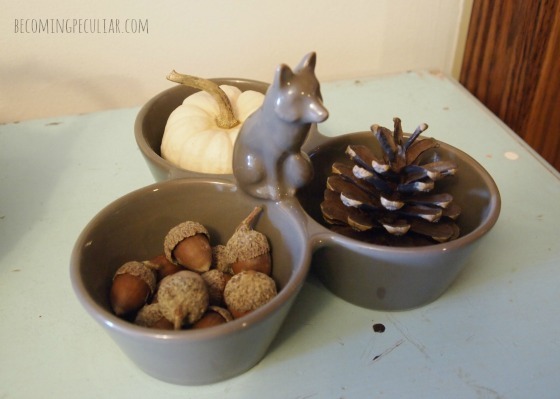 You can also follow my Fall Pinboard for other ideas! I’m always adding more! You might also like to check out how we celebrated the summer solstice and why we might want to, from a Christian perspective. I also share how we celebrate the spring equinox. Thank you for a lovely, inclusive post!